An amazing and hardy plant - a relic of prehistoric times, yet suited to British gardens. Supplied as a sawn log 18-25cm tall, pot on or plant shallowly in the garden soil. New fronds will unfurl in weeks. Tree ferns were a firm plant hunter's favourite from Victorian times, a symbol of wealth and travel experiences to Australia. They have maintained this sense of mystique ever since. Now you too can grow these surprisingly easy exotic looking plants too. Harvested under strict License from woodland clearance in Australia and Tasmania, these astonishing plants really will delight and amaze. They grow under the woodland canopy, in the shade, so grow them here in a sheltered spot too. These 'potter' logs are at least 10 years old, and have been cut back and harvested dormant. When you water them via the top crown, they will burst back into life, like it's the new rainy season! Because they grow in leaf canopies, most of their food comes from leaves falling into their giant shuttlecock like fronds, funnelling the goodness into the growing crown. That's hard to achieve in UK gardens so we provide 500ml of concentrated tree fern food, which mimics this feeding method. Even at this size of log at 20-25cm tall, new fronds of almost 1M in length will unfurl spectacularly within a Month or so of you watering it. It's amazing when they come how quickly they grow. The plant is hardy in Winter, although the fronds will die back. Cutting these off when they die back is what creates the new trunk, which slowly inches up over many, many years. Keep the crown protected in Winter with a layer of straw to keep cold and wet out. When you get it home, plant it in a big pot, or in the garden soil. It takes almost 2 years to root in, so do not be alarmed by this slow growing beauty. Supplied as a 'potter log', about 20-25cm tall, cut back, from which new fronds will quickly emerge. Also includes 500ml specialist tree fern feed. During the season, these may be supplied with fronds already elongated. Protect new fronds from frost in Spring. Do not be tempted to remove the dead and dried leaves as they provide extra protection from freezing in winter and protect the plant from drying winds. In addition, they help keep humidity around the trunk. Plants grow by about 2.5cm (1in) a year so it is best to buy as large a plant as possible if you want an instant effect. For best results, plant in humus-rich, neutral to slightly acid soil. Soak the base of the trunk, then plant just enough of it to ensure that the plant remains stable. After planting frondless tree ferns, water every day until the foliage starts to emerge. To encourage rooting, don’t feed the plant during its first year. Tree ferns can also be grown in pots and should be planted in loam-based ericaceous compost, adding about 20 percent peat-free potting media for additional humus. Apply a half strength liquid fertiliser once a week during the growing season or add a controlled-release granular fertiliser at the base of the plant in spring. Top-dress container-grown plants or pot on annually in spring. The trunk and crown of tree ferns will not tolerate drying out, so water regularly to ensure the trunk remains damp, and spray the trunk with water during hot weather (and also during dry conditions in winter). After the first year of planting, apply a liquid feed to the fronds and trunk once a month, from mid-spring to mid-summer, when the plant is in growth. Alternatively, spread controlled-release fertiliser around the base of the plant in spring. Young plants can be stood outside in the summer but keep out of direct sunlight. Avoid indoor temperatures greater than 32°C (90°F). Hardiness tends to increase with the height of the growing point above the ground so young plants with no trunk are not really suitable to overwinter outdoors except in very sheltered sites. To protect plants growing outdoors to avoid damage to fronds, put a handful of straw in the crown and fold the fronds in on themselves. Container-grown plants in milder areas should be placed in a sheltered position and the container bubble-wrapped from late October. More substantial wrapping is needed if you have a more exposed garden. Remove wrapping in spring, before new fronds come into growth. 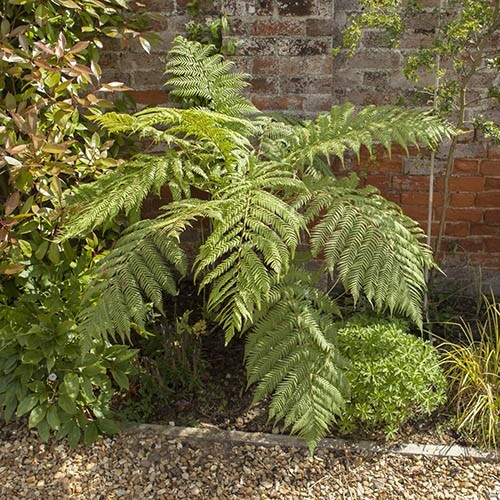 In cold gardens tree ferns are best lifted and brought into a conservatory or greenhouse.